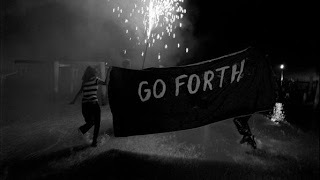 In this handy posting from the resident Whitmaniac at P&PC's Midwestern outpost, Eric Conrad looks back at the 1860 edition of Leaves of Grass and finds the Good Gray Poet pointing the way toward 21st-century corporate branding techniques. Last summer, Levi’s enlisted Walt Whitman for its highly publicized “Go Forth” campaign, an ambitious set of promotions that appropriated Whitman poetry, photography, and even the sole surviving recording of Whitman's voice. Naturally, this got hearts at the Poetry & Popular Culture home office all aflutter, but not everyone shared the love. Slate’s Seth Stevenson undoubtedly spoke for multitudes when he lamented that Whitman’s appearance as Levi’s “involuntary spokes-celebrity” could easily be considered a “desecration of all [Whitman] stood for.” Stevenson praised Cary Fukunaga’s 60-second film as a “small artistic gem” but ultimately felt it was ruined by “that Levi’s logo at the end.” The critical consensus was clear: branding a bard bordered on blasphemy. Would Whitman have been so quick to point the same finger? Maybe not. A look back 150 years to the 1860 Leaves of Grass—the third and most aggressively promoted edition of Whitman’s poetry—shows Whitman himself going forth with his own revolutionary blend of poetry and publicity. That year, in fact, the Whitman brand was born—and I’m not talking about chocolates. 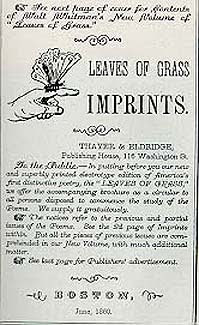 In and on this edition (and on Leaves of Grass Imprints, a 64-page pamphlet printed to advertise Whitman’s new poems) is, for the first time, the Whitman logo: a butterfly resting on an outstretched index finger. Whitman would revisit and re-enact this image multiple times throughout his life (see the well-known photograph at the end of this posting, for example), but it's the 1860 birth of the butterfly brand that is possibly most striking. 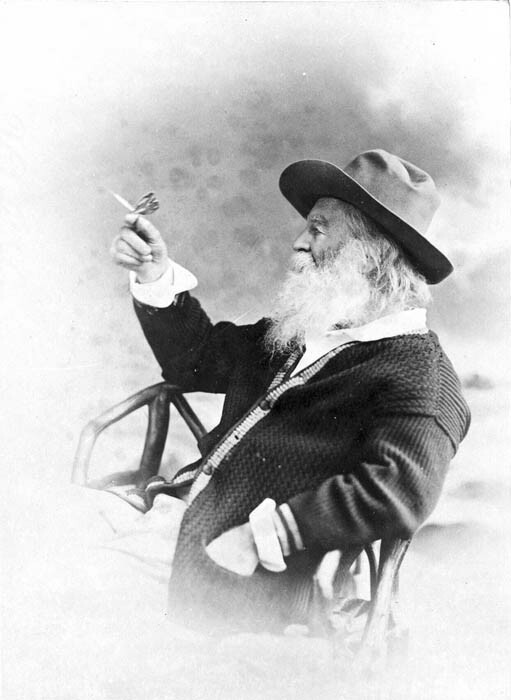 The image has been interpreted in various ways (e.g., a joining of man and nature, a promise of spiritual rebirth), but what folks have so far missed is precisely what would have been most obvious to 19th-century readers—and what would be most disturbing to anyone determined to “save” Whitman and poets from the vagaries of advertising today. Whitman’s butterfly icon that would eventually become nigh synonymous with Whitman himself was first and foremost a manicule, one of the ubiquitous little pointing hands of the marketplace—the most common print and manuscript symbol of the 19th century, and the very appendage of advertising. By 1860, these little hands were pointing their fingers at anything and everything you might want to buy, including Leaves of Grass. 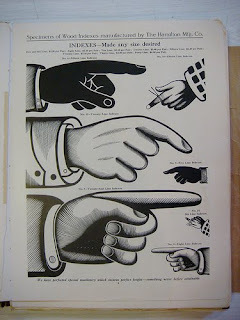 The American Dictionary of Printing and Bookmaking (1894) defines the function of a “Fist” (the most common name for a manicule produced by a printing press) as “[serving] to call attention to the words following.” In 1860, Whitman aligned his role as a poet with this function of the manicule: both he and the pointing hand transfer value onto what follows them. 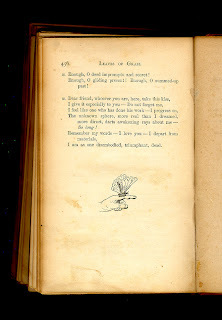 The last poem of the 1860 Leaves, “So Long!,” and the manicule that accompanies it, emphasize the ephemeral and contingent nature of Whitman’s poetic project. Here, Whitman admits that all he knows “at any time suffices for that time only—not subsequent time.” “[L]et none be content with me,” he writes, “I myself seek a man better than I am, or a woman better than I am.” The manicule becomes Whitman’s advertisement for “what comes after” his poetry—a finger pointing to a blank page and even beyond the book to “a hundred millions of superb persons” who have yet to exist and to the millions of American promises yet to be fulfilled. With his butterfly adorned-index finger, Whitman turned the most common advertising symbol of the age into a logo for Leaves of Grass. So, for anyone convinced that Whitman would have given the finger to Levi’s re-branding of his name, remember that in 1860 it was Whitman himself who pointed the way. Eric Conrad is the new managing editor of the Walt Whitman Quarterly Review and member of the Walt Whitman Archive staff. His most recent publication, “Am I Not a Man and a Poet? : A Recently Recovered Whitman Caricature,” appears in the Winter 2010 WWQR.